The Restaurant de la Colonne tapestry is based on the work by artist Fabric de Villeneuve. His works are in the style of the 17th and 18th century masters and his works are displayed in galleries in Ontario and Paris. 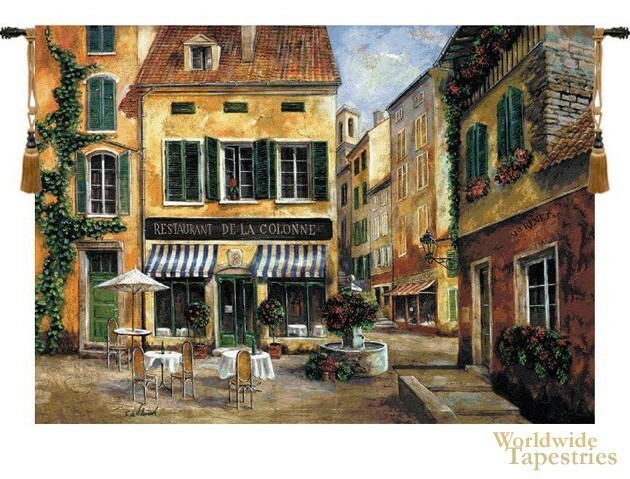 Here we see a quaint and gorgeous scene of a restaurant hidden away in a town full of rustic charm of the French town. The scene is filled with details and the use of color and composition is masterful and is characteristic of the romantic and quaint works of de Villeneuve. This Restaurant de la Colonne tapestry is backed with a lining and a tunnel for easy hanging. Note: tapestry rods and tassels, where pictured, are not included in the price.